A wildlife raid in Indonesia yielded startling results after 125 exotic birds were found squashed into pipes. 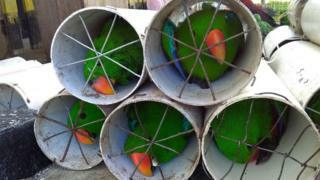 Police say 84 eclectus parrots and 41 endangered white cockatoos were stuffed into drain pipes sealed by wire. Indonesia's vast jungles are home to many threatened bird species. The country is trying to rein in a rampant wildlife trade. Separate raids were conducted in parts of eastern Indonesia, leading to the arrests of four men. If found guilty, they face jail sentences of up to five years and fines of 100m Rupiah ($7,400; £5,600). Indonesia is home to a large-scale illegal trade of birds, many of which find themselves sold in giant avian markets. Many poached birds are also smuggled abroad. 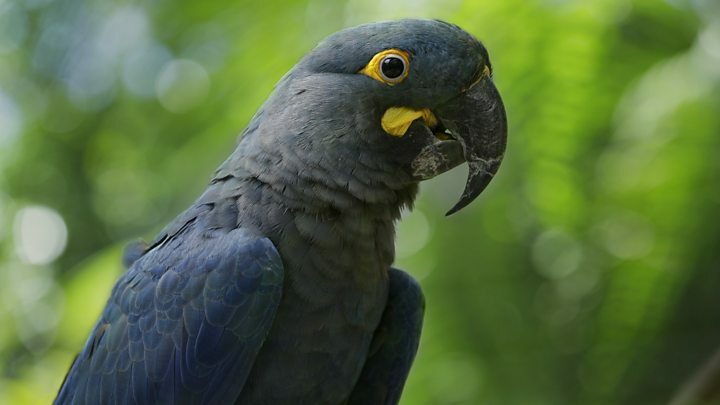 Dwi Adhiasto of the Wildlife Conservation Society believes the birds uncovered from Monday's raid were on their way to the Philippines, given links to "a parrot smuggling network there". Native to Indonesia's North Maluku province, white cockatoos are listed as endangered by the International Union for Conservation of Nature (IUCN). The IUCN says there are between 43,000 and 183,000 white cockatoos left in the world - but their numbers are falling due to bird poaching and trapping, and destruction of their natural habitats.